The Montrealer along Lake Champlain at East Alburg, Vt. 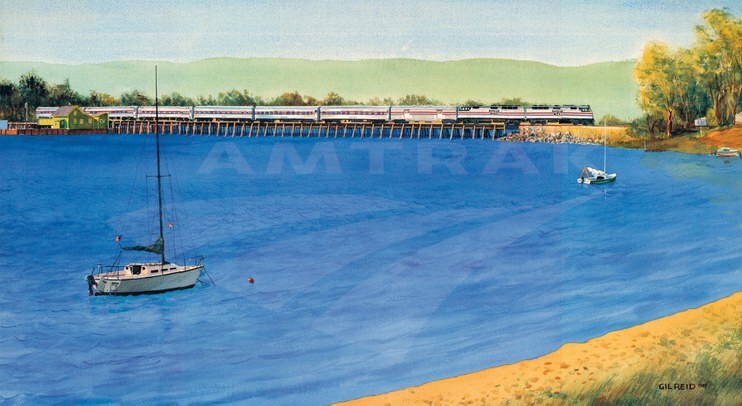 This watercolor by artist Gil Reid was featured on the 1990 Amtrak calendar. The bright blue waters of Lake Champlain, famed green hills of Vermont and the silver tones of the Montrealer (Washington-Montreal) create a pleasing color palette in this 1990 watercolor by well-known artist Gil Reid. It seems appropriate to feature on the blog as summer starts to begrudgingly give way to autumn. The Montrealer near Northfield Falls, Vt.
Reid shows the train, pulled by two F69PH-AC diesel locomotives, at East Alburg, Vt., just south of the border with Canada. Because it also served towns in French-speaking Quebec, the Montrealer featured menus and announcements in English and French. In the winter, the line was popular with skiers who used it to reach Vermont resorts including Stowe, Bolton Valley and Jay Peak. A highlight of the train was "Le Pub," a "dimly-lit, romantic cocktail lounge car" featuring a piano player/singer on weekends. 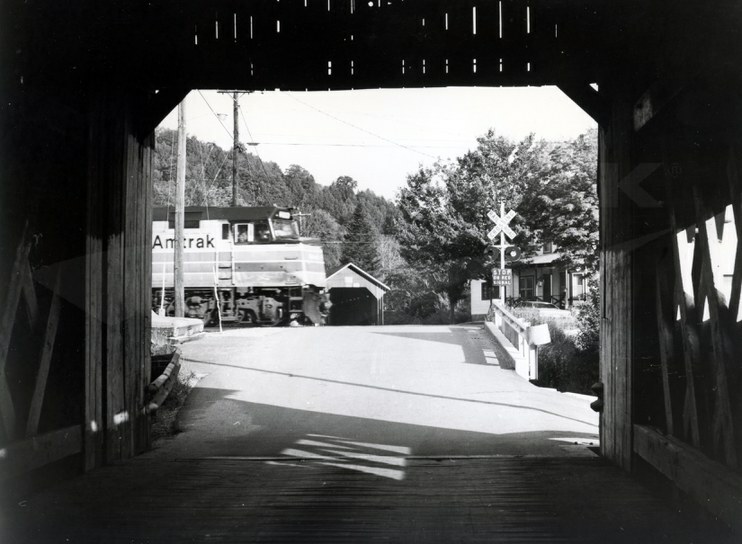 In 1995, the overnight Montrealer was replaced with the daytime Vermonter, which has its northern terminus at St. Albans, about 17 miles southeast of East Alburg by rail. The Vermonter is financed primarily through funds made available by the Vermont Agency of Transportation, the Connecticut Department of Transportation and the Massachusetts Department of Transportation (MassDOT). 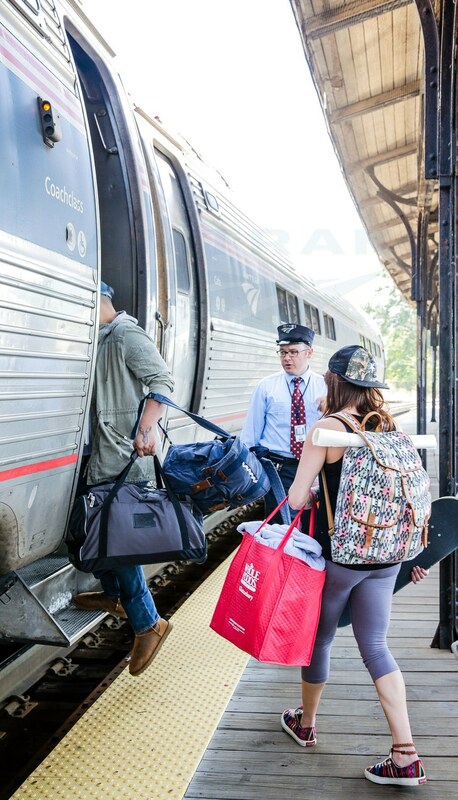 Covering 605 miles between Washington, D.C., and St. Albans, the daily train serves 32 stations in 10 states. The route is especially popular with those seeking views of fall foliage, and it continues to offer easy access to winter resorts. the Vermonter at Hartford, Conn., in fall 2015. Due to rehabilitation of the Connecticut River Line, a project spearheaded by MassDOT, the route of the Vermonter in Massachusetts shifted westward in December 2014. From 1972 until 1987, the Montrealer had used this section of railroad, but the train was rerouted to the east due to deteriorating track conditions. The ultimate goal of the line rehabilitation and reroute is to reduce travel time and improve the train’s on-time performance. Since 1974, Amtrak has been involved with the publication of an annual wall calendar that generally features a train, new equipment or important pieces of rail infrastructure—and sometimes all three. Of all the artists whose work has graced the official calendar, Gil Reid holds the record for most pieces featured. His 18 works showcase trains such as the National Limited (New York/Washington-Kansas City) and Crescent (New Orleans-New York); E-60, AEM-7 and P30CH locomotives; and significant infrastructure including the Horseshoe Curve and Los Angeles Union Station. Reid was already well-regarded for his accurate depictions of railroading when he began the Amtrak commissions in 1974. Though born in St. Louis in 1918, Reid spent most of his childhood in Richmond, Ind., near the tracks of the Pennsylvania Railroad. Following World War II, during which he received a Purple Heart, Reid began a career in commercial art. He eventually worked full-time for Kalmbach Publishing – the company behind Trains and other railroad magazines – as an assistant artist and then assistant art director. 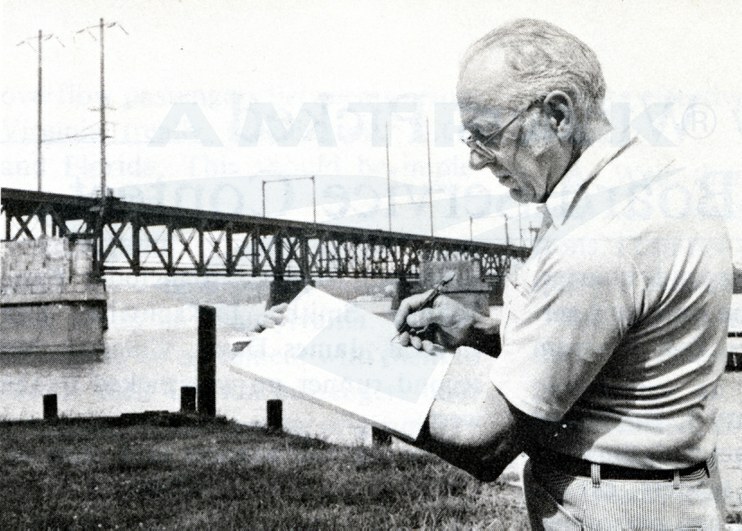 Gil Reid sketches the Susquehanna River Bridge in 1979. Primarily done in watercolor, Reid’s Amtrak work displays his technical precision and attention to detail. Through thoughtful perspectives, trains often stretch into the distance, allowing the viewer a closer look at the various locomotives and cars. Although beautiful landscapes, including snow-capped mountains, watery bayous and stark deserts, are featured, the trains always take center stage. Click here to view some of Reid’s other calendar scenes. Do you have favorite memories from riding the Vermonter or Montrealer? Share them with us below.